A major fund-raising activity linked to the Golden Jubilee celebrations of Alumni Friends (2017-2018), is the tax-deductible 50th Anniversary Fund, with a target of providing 50 new student bursaries of $1,000 each, to be presented to students in 2017-18. To donate, click here. 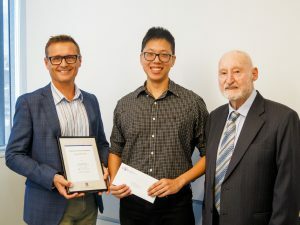 October 2018: Jeff (Ting-Uei) Lee (centre) pictured receiving receiving The Patricia Moffett Bursary for a Student from the School of Civil Engineering from Doug Moffett (R). Jeff is an RhD student, nominated for the award with the support of his UQ supervisor, Dr Joe Gattas. The recommendation from Professor Simon Washington, Head of School (L), included a large number of statements of support from fellow students and from staff—including praise for Jeff’s “broad and high level of understanding” of projects, his “diligent,” inspiring, helpful, and enthusiastic assistance, and for “great maturity and leadership skills.” The nomination focused on Jeff’s passion for his chosen area of study, and his desire to contribute to the life of the University. 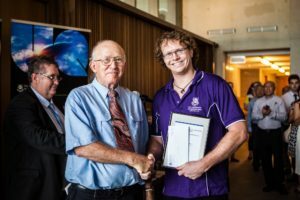 Doug Moffett congratulated Jeff on his study and service, and shared information about Patricia Moffett’s background, and also of Doug’s memories of study at UQ (when engineering was based in Brisbane’s CBD). May 2018: Kagi Y. Kowa Makki (R), pictured receiving The Penny Wensley Award for a Student from the School of Social Science. 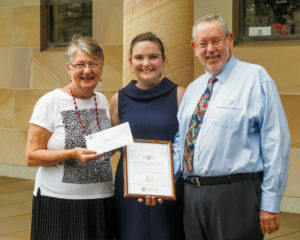 The Award was presented by Anne Mullins (L – volunteer co-convenor of the UQ Alumni Book Fair Rare Book Auction) on behalf of the donor, The Honourable Dr Penelope Wensley AC. In addition to undertaking a degree in Social Science, majoring in development studies, Kagi has established Nubia Designs (a social enterprise which uses creative arts to advocate for social change and to improve migrant and refugee experiences through art therapy). Kagi also volunteers at Mu’ooz Restaurant—a not-for-profit organisation that supports women from refugee backgrounds. 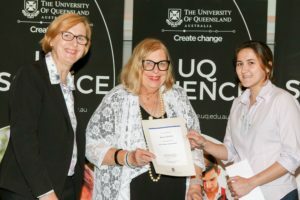 The Award was presented at a School event, held in UQ’s Alumni Court. May 2018: Rhiannon Webb (L), pictured receiving the De Gruchy Bursary for a Student from the School of Chemical Engineering. 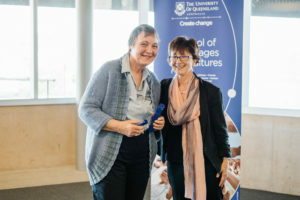 The Award was presented by Cathy Urquhart (R), on behalf of the donor, Associate Professor G F De Gruchy. 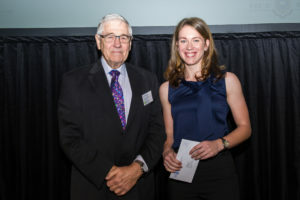 Rhiannon Webb, was selected by the Head of School of Chemical Engineering, Professor Peter Halley, “for her outstanding service contributions as President of the Chemical and Environmental Engineering student society (CHESS).” As CHESS President, Rhiannon led the development of new initiatives, including technical presentations, job training events, international student inductions and mentoring programs, and the organisation of industry-student mentor events. The Award was presented at a special Morning Tea, hosted by Dr Greg Birkett. 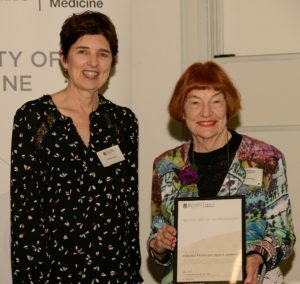 April 2018: Lauren Peck (L), pictured at the Faculty Prizes and Scholarships evening, receiving The Dr Konrad Hirschfeld CBE Bursary for a student from the School of Clinical Medicine from Emeritus Professor Mary Mahoney AO (R). 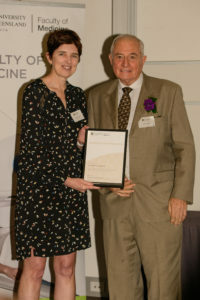 The award recognises Lauren’s “innovation, leadership and service for creating and launching UQMind, fostering initiatives to improve wellbeing and mental health for medical students.” In addition to her study, Lauren is the 2018 UQ Medical Society (UQMS) President, and is enrolled in the Medical Leadership Program. 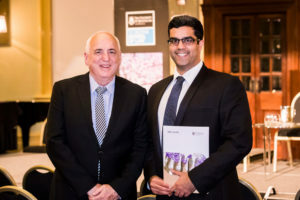 April 2018: Paul Marshall (Centre), recipient of the Feona Walker Award for a QBI Student, pictured with Feona Walker (L) and QBI Director Pankaj Sah (R). Paul is an international student from Canada who commenced PhD study in the QBI Bredy lab in January 2017. Paul’s nomination for this Award was made in recognition of his service at QBI, including his active involvement in the QBI Student Ambassador Program. In addition, Paul was congratulated for his willingness to volunteer to participate in various QBI events/activities, and to assist/mentor fellow students at the Institute. The nomination also highlighted Paul’s “excellent progress in his PhD research project work,” and his 2017 selection as a UQ “Global Change Institute Scholar.” Picture: Nick Valmas. 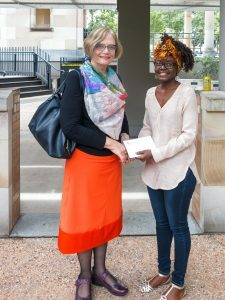 April 2018: Mrs Svetlana Hadgraft (L) presenting Emma Kukulies (R) with the Alumni Friends Golden Jubilee Bursary for student from the School of Human Movement and Nutrition. Emma is a third year Bachelor of Exercise and Sport Science student (clinical exercise physiology), who volunteers in the Para START program (designed for people with moderate to severe cerebral palsy who are engaging in performance-focused swimming training). Emma acts as a training buddy for the young people in the research program—attending training, encouraging the athletes, and supporting the swimmers and researchers. 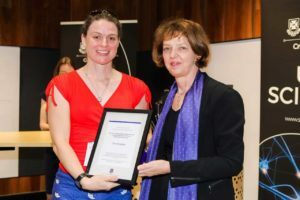 The citation described Emma as “dedicated, empathetic, enthusiastic.” The award was presented by Lana, who is a long-standing and hard-working UQ Alumni Book Fair volunteer, at a morning tea, hosted by the School. Picture: Caroline Day. March 2018: Trishala Kalra (Second from L), pictured receiving the Blaszczyk Family Award for a student from the School of Health and Rehabilitation Sciences, from Mrs Margaret Blaszczyk (Second from R). 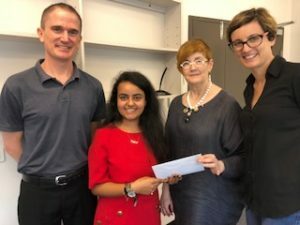 Trishala is an audiology student, and was selected for the award by Associate Professor Wayne Wilson (Head of Discipline, pictured L) and Dr Dunay Schmulian (Lecturer in Audiology, pictured R). 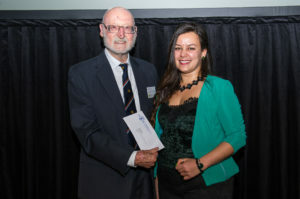 The nominated commended Trishala for her study, and in particular for her work during a placement in Mt Isa with the Organization Deadly Ears. 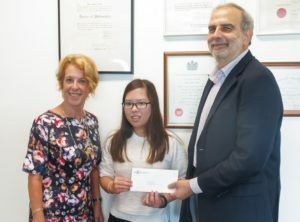 February 2018: Anna Sze Ni Chang (Centre), pictured receiving the Alumni Friends’ Golden Jubilee Bursary for a Student from the School of Pharmacy, presented by Gary Lambrides (R) and Deb West (L) on behalf of Book Fair team. The presentation took place over morning coffee, hosted by the Head of School, at the Pharmacy Australia Centre of Excellence (PACE, Woollangabba). Nominating Anna for the award, Professor Peter Little, Head of School, commended her voluntary work in the School. Anna spent the Summer 2017-18 semester working (on a voluntary basis) within the School, gaining valuable experience of working in a pharmacy laboratory. February 2018: Elizabeth Bartetzko (2nd from the right), pictured receiving the Alumni Friends Golden Jubilee Bursary for a student from The School of Nursing, Midwifery and Social Work. The award was presented by Jan and Harry Thompson (L and 2nd L), who are Book Fair volunteers. Harry is also a long-standing member of the Executive Committee. Elizabeth received the award at the Abel Smith Lecture Theatre pre-commencement seminar for nursing and midwifery students. 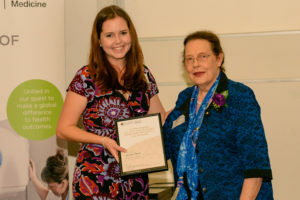 Elizabeth is in the final year of the the Bachelor of Nursing and Bachelor of Midwifery program, and was commended for her study, service (which includes acting as a Student Ambassador and work on the UQ Young Scholars Program), and innovation (including involvement in the Student Leaders Summit, National Healthfusion Team Challenge, and work as a UQ Summer Research Scholar). John Martin (far right) also represented Alumni Friends at the event. February 2018: Olivia Choice (R), was awarded the Horner Family Award for a student from the School of Education, presented by Ros Craig-Smith (L, Book Fair volunteer, and former teacher), on behalf of Mr Gary Horner, at the 2018 School Professional Foundations Program event. 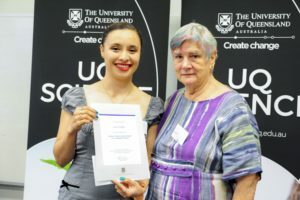 Olivia, who is enrolled in a Bachelor of Education (Primary) program, was commended for her commitment to Queensland and for the experience she brings to the classroom. During the Bursary assessment process, Olivia spoke about the importance of “qualities such as caring, empathetic, understanding and respect,” particularly for teaching in rural and remote locations. Olivia was also commended for her volunteering in Cambodia, teaching children of various ages and ability levels in the same class. December 2017: Christian Rizzalli (L) was presented with The Fisher Family Bursary for a Student from the School of Communication & Arts by Dr Catherine Lawrence (R). The award was presented at a special function held to celebrate the 40th year of the study of Art History at the University. Christian won the best essay award for ‘Readings in Art History.’ The selection panel was impressed by Christian’s “compelling and insightful analysis,” noting “Christian’s prose is fluid, his insights are original, and he has a flair for strong argumentation.” Christian was also recognised for his ability to combine academic success with his engagement with the broader UQ student art history community (as Treasurer with the Society of Fine Arts). 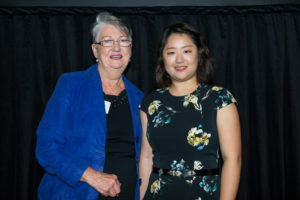 December 2017: Yvonne Chan was selected as the recipient of the Fryer Library Dr Rhyl Hinwood AM Prize. Yvonne won the November Fryer Library ‘Hidden Treasures’ competition, in which students were encouraged to share a favourite ‘treasure’ from the Fryer Library’s collections (shared as #myfryertreasure). 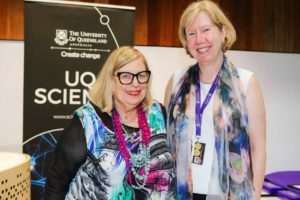 Dr Rhyl Hinwood AM (pictured above) announced the winner, and spoke about the winning entry, at a special UQ Library Awards event. 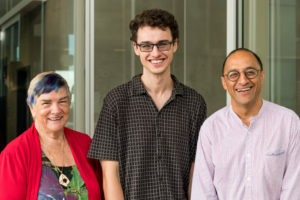 December 2017: Reuben Heim was selected as the winner of the UQ Library competition. Students were encouraged to think about ‘what the UQ Library means to them’ (#myuqlibrary). 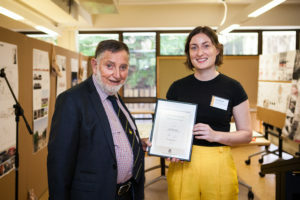 The Lawrence Family Award for a student selected by the UQ Librarian was presented by Geoff Lawrence (R) at the UQ Library Awards evening. 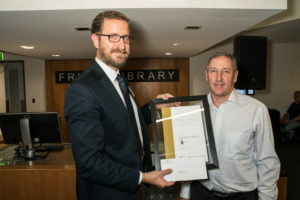 Simon Farley (L, Manager, Fryer Library) accepted the award on behalf of Reuben. November 2017: Marielle Ong (L), recipient of the Dalma Jacobs Award (Female Student) for Excellence in Mathematics. 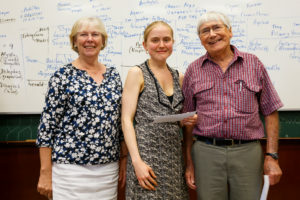 Dalma Jacobs (R) presented the award at a special Science Faculty event, and congratulated Marielle on a nomination which cited both innovation (in research as an Honours student and MPhil student), and involvement. 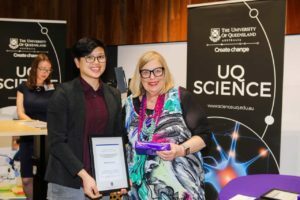 Marielle was congratulated on much hard work, and also for making a positive contribution, as an engaged member of the mathematics student community during her time at UQ. 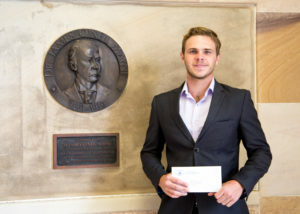 November 2017: Tim Staples was awarded the Libbie Wilson Bursary for a student selected by the School of Biological Sciences. Tim was congratulated for his service-ethos, and a nomination which referred to his “friendly patient nature,” and described him as “an extremely valuable member of the UQ biological sciences community.” Dr Catherine Lawrence (President, pictured R) presented the letter of congratulation, from Mrs Elizabeth Wilson, to Associate Professor Margaret Mayfield (L) who received the award on behalf of Tim Staples at the special November Science Faculty event. November 2017: Professor Melissa Brown, Executive Dean, Faculty of Science (R), pictured receiving the Dalma Jacobs Bursary for a student from the School of Mathematics & Physics on behalf of Stephanie Green (who was unable to attend the event). 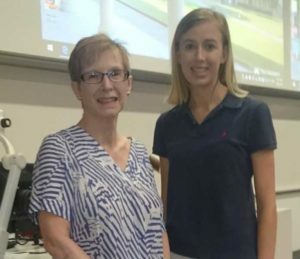 Dalma Jacobs presented the award at a special Science Faculty event, where Stephanie was commended for involvement with numerous student activities in the Maths Student Society. The nomination also noted the work Stephanie had undertaken during the year, when representing the views of undergraduate students through the school’s Teaching and Learning Committee. 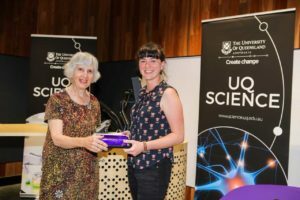 November 2017: Alexandra Brown (L), recipient of the Alumni Friends Golden Jubilee Bursary for the School of Earth & Environmental Sciences, presented by Dr Peter Jell (R) on behalf of the UQ Alumni Book Fair team, at a special Science Faculty Awards Presentation. 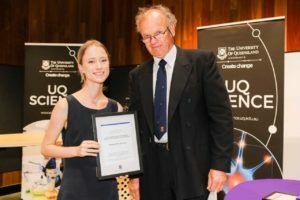 Alex was nominated for her outstanding commitment to service (both with reference to the UQ student body, and to the broader community). Activities included 2017 Fossil Free UQ Coordinator, Student Intern for the Wildlife Preservation Society of Queensland, and the creation of the GEMS Volunteer Program (linking Environmental Management students with local creek catchment groups). 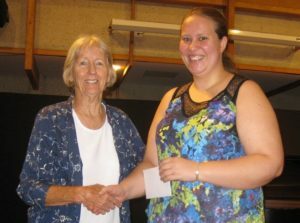 November 2017: Nicole Walker (L), receiving the Alumni Friends Golden Jubilee Bursary for a Student from the School of Psychology from Pauline Beames (R, Golden Jubilee Committee Member). 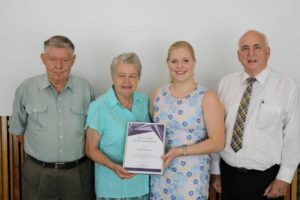 Recognising that aged care globally is under-resourced, Nicole developed a Volunteer Student Placement Program for undergraduates who are to be placed at Anglicare (which Nicole called the ‘Good Neighbour Program’ ). Professor Virginia Slaughter, Head of School, described this as “an exceptional example of both innovation AND service.” Picture credit: Mazlan Maskor. November 2017: Jason Weigel (R), receiving the Dr. Colin Gan Cheong Kiat Bursary (for a student from the School for Information Technology & Electrical Engineering). The award was presented, on behalf of Dr. Colin Gan Cheong Kiat, by from Professor Aleksander Rakic, Associate Dean (External Engagement), Faculty of Engineering, Architecture and Information Technology (L). 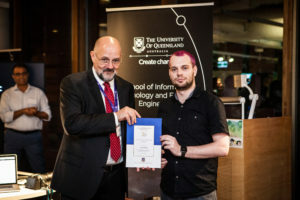 The award recognises Jason’s service to the School, the University, and the Australian computer science community. Jason has led UQ’s hosting of Govhack for the last three years (when the number of entrants has doubled). Jason has been particularly effective at bringing in local and state government partners in Queensland to provide data sets for the competition, and prizes for the entrants. Jason’s research interests include remote collaboration, augmented reality, virtual reality, and game design. November 2017: Sally Birkett (centre), recipient of the R.D. & L.V. Milns Bursary for excellence in Greek &/or Latin, pictured with Emeritus Professor R.D. Milns (R) and Mrs L.V. Milns (L). 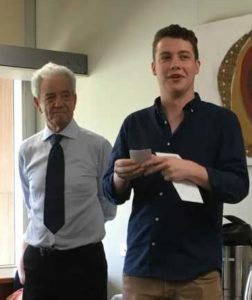 Emeritus Professor Milns and Mrs Milns commented on the importance they both place on learning Greek and Latin, and were particularly delighted to congratulate Sally on her studies. The nomination described Sally as “a very capable student in Greek.” Sally plans to use the Bursary during her travels to Greece, as part of her 2018 Honours year Greek studies. Picture credit: Geoff Lawrence. November 2017: Dr Janette McWilliam (L, Lecturer in Classics and Ancient History and Director/Senior Curator RD Milns Antiquities Museum) congratulating Samantha Levick (R), recipient of the Friends of Antiquity Bursary for a Student Associated with the R.D. Milns Antiquities Museum. Pictured at the Friends of Antiquity Sunday Series Lecture, ‘The Lead-up to the Trojan War” (lecture by Con O’Brien). 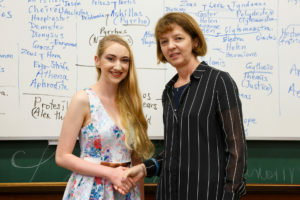 The nomination noted that Samantha “is a good all-round student who has been very active in the life of the R D Milns museum.” Picture credit: Geoff Lawrence. 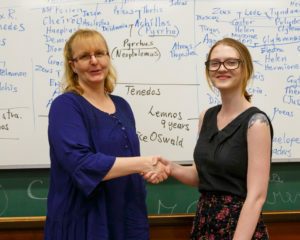 November 2017: Tiffany Hales (L), recipient of the Alumni Friends Golden Jubilee Bursary for a Student from the School of Historical and Philosophical Inquiry. Tiffany is pictured with Dr Catherine Lawrence (R, President, Alumni Friends, congratulating Tiffany on behalf of Denis and Gina Brosnan). The nomination, from the Head of School, referred to the extent to which Tiffany is involved with the HaPI School. In particular, Tiffany is vice-president of the Classics Student Society and was very involved in putting on the Greek play, Lysistrata, during the year. Tiffany will be putting the funds toward a forthcoming study trip. Picture credit: Geoff Lawrence. 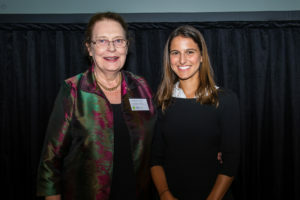 October 2017: Reem Felemban (R), pictured receiving the Veterinary Science Jacobs Family Prize for a Female Student, presented by Dalma Jacobs (Centre). Together with Shuting Jin, Reem initiated the School of Veterinary Science Peer Support Network, in conjunction with Student Services and SVS staff. The aim of this group is to support student health and well-being within the school. Professor Jenny Seddon (then acting Head of School) is pictured left. 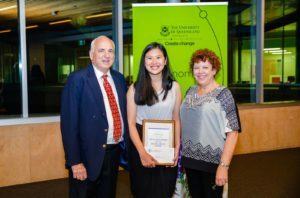 October 2017: Ching Chong (Centre), pictured with John Martin (L) and Barbara Martin (R) at the School of Economics Annual Scholarships and Prizes Evening. 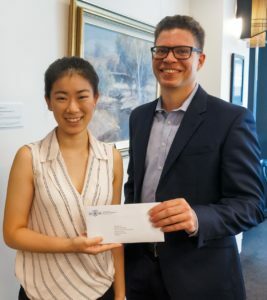 The Head of School nominated Ching Chong for the Alumni Friends Golden Jubilee Martin Family Bursary for a student from the School of Economics, commending the student for combining academic success (“a straight 7s student”) with volunteering (“with the Lord Mayor’s office to promote the University“). 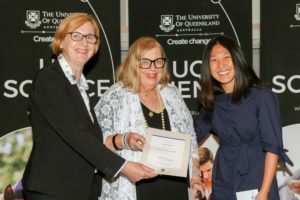 October 2017: Shuting Jin (R), pictured with Professor Jenny Seddon (then acting Head of School, L), receiving the School of Veterinary Science Jacobs Family Bursary, presented by Dalma Jacobs (Centre). Together with Reem Felemban, Shuting Jin initiated the School of Veterinary Science Peer Support Network, in conjunction with Student Services and SVS staff. Both students were congratulated for creating a group designed to support student health and well-being. October 2017: Lina Marcela Walker (L), pictured receiving the Feona Walker Gatton Campus Award from Feona Walker (R, and no relation!). Lina is the president of the UQ Wildlife Association, and was nominated for being heavily involved in organising and promoting a number of events (for the wildlife association, and for two other student groups/charities, requiring good communication and cooperation). Lina also organised buses to include St Lucia students in the events program. 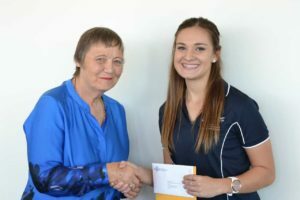 October 2017: Alicia Kelly (R), pictured receiving the School of Agriculture and Food Sciences Alumni Friends Golden Jubilee Bursary, presented by Patricia Jones (R) at the Gatton campus. 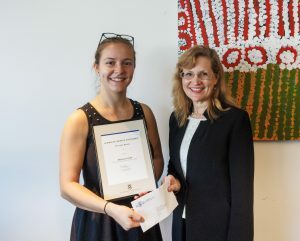 Alicia was recognised for her work in community service as a Student Ambassador, as a student representative at the SAFS Equity, Diversity and Inclusion Committee, and for her work as a member of the Student Relations team. October 2017: Juliet O’Brien (L, on behalf of Mrs Susan Horner) congratulating Amelia Lane (R), recipient of the The Horner Family Bursary for a School of Music Student. A second year Bachelor of Music (Honours) student, Amelia plays the tuba with the UQ Symphony Orchestra, and is currently studying with Thomas Allely (QSO principal tuba). Amelia is the inaugural President of the Music Students Society. In addition to working hard to establish the new society, Amelia assists with the Faculty’s Hass Crew initiative (which aims to improve the experience of first year students ), and has been involved in running music experience concerts for the people Micah Projects supports (a homelessness support organisation). 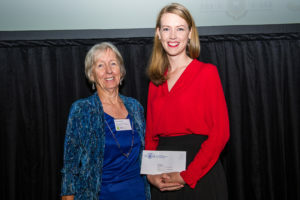 October 2017: Juliet O’Brien (L) pictured with the winner of the O’Brien Family Prize, Cassie Slater (R). 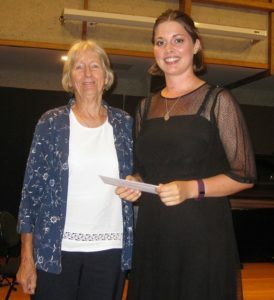 Cassie was judged the winner in a competition held for UQ School of Music (Wind and Brass) students. An emerging flautist, Cassie is in her fourth year at UQ, studying a Bachelor of Music (Honours), majoring in performance with Patrick Nolan. As the recipient of the O’Brien Family Prize, Cassie performed Prokofiev’s Flute Sonata, Op. 94, playing the first and third movements to great acclaim. 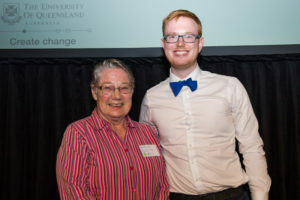 September 2017: Edwin Davis (R), recipient of The Brian McGrath Bursary, presented by Mrs Heather McGrath (L) at the UQ 3MT® Final (Customs House). With his three-minute presentation “Drones—Gone with the Wind!”, Edwin (School of Information Technology and Electrical Engineering) was the Faculty of Engineering, Architecture and Information Technology UQ 3MT® Finalist, & Overall winner of the 2017 UQ 3MT® Award. 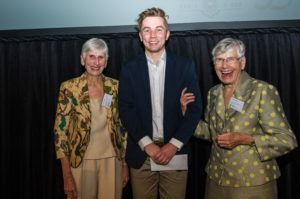 September 2017: Chris McMillan (centre), recipient of The Lorna McReadie Bursary, presented by Dr Melda and Ms Topsy Moffett at the UQ 3MT® Final (Customs House). Chris’ three-minute presentation,“Clamping down on the flavours of Flu,” was judged the Runner-up, and Chris also received the prestigious People’s Choice Award (also provided by Alumni Friends). 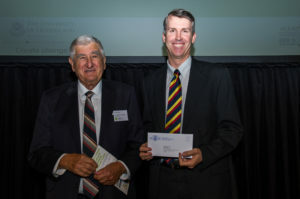 Chris represented the School of Chemistry and Molecular Bioscience, and was the Faculty of Science UQ 3MT® Finalist. 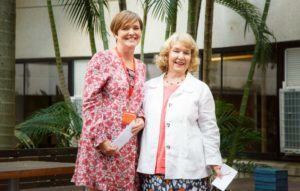 September 2017: Shari O’Brien, School of Human Movement and Nutrition Sciences (R), receiving the Alumni Friends Golden Jubilee Bursary from Mrs Juliet O’Brien (L). Shari was the ‘Wildcard’ Entrant in the prestigious UQ 3MT® Final, held at the Brisbane Customs House, where she presented “Learning to improve foot control in Cerebral Palsy.” Shari qualified for the UQ Final following her presentation at the Faculty of Health and Behavioural Sciences Final. July 2017: Mrs Svetlana Hadgraft (L) pictured with Associate Professor Marisa Cordella-Masini (Director of Studies) at the School of Languages and Cultures event celebrating the presentation of the Alumni Friends Golden Jubilee Bursary (recipient Dominic McCrea). 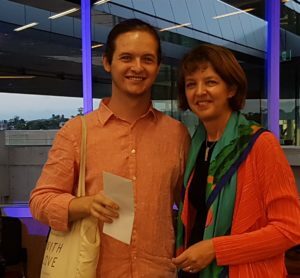 July 2017: Dominic McCrea, recipient of the Alumni Friends Golden Jubilee Bursary for the School of Languages and Cultures, holding his letter of congratulation from Mrs Svetlana Hadgraft. Dom is pictured alongside the Dr Rhyl Hinwood AM sculpture of UQ philanthropist Dr James Mayne. 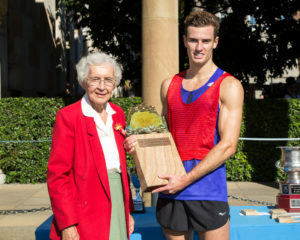 May 2017: Mrs Joan Cribb presented the trophy, and an Alumni Friends Golden Jubilee Bursary, to Max Whiteoak, who scored his second career Great Court Race win (1:30:10). 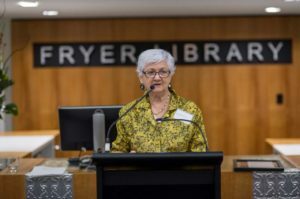 Mrs Cribb is a foundation member of Alumni Friends, and has been a very active volunteer and supporter of the UQ Alumni Book Fair®, having worked in connection with 19 of the 20 Book Fairs. This represents almost 40 years of volunteer work for the Association, and thus also for UQ. 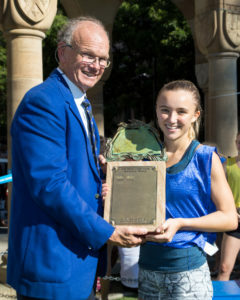 May 2017: Josephine Auer (R) won the Women’s Great Court Race, receiving the trophy, and $1,000 Alumni Friends Golden Jubilee Bursary, from Dr Peter Jell (L). Peter Jell is a UQ Blue in Rowing from 1966, and has been an active participant in that sport for more than fifty years. He is an active volunteer in connection with the Alumni Friends’ Book Fair, having recently taken over responsibility for the logistics for the Bookhouse team. May 2017: Selecting Milan Gandhi (R) as the winner of the Alumni Friends Golden Jubilee Bursary, the School of Law noted that “Milan is a real asset to our community at the Law School and we are excited about his vision for social entrepreneurship in law.” Award presented by John Martin (L) on 10th May 2017, at the UQ TC Beirne School of Law Awards celebration, The Long Room, Customs House. 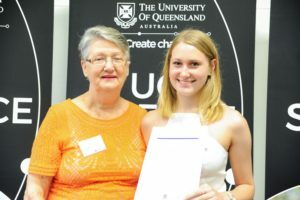 April 2017: Hayley Kake (L), winner of the #UQArtInspires competition, organised by the UQ Art Museum, pictured receiving the Alumni Friends Golden Jubilee Bursary. The award was presented by Margaret Blaszczyk (R). 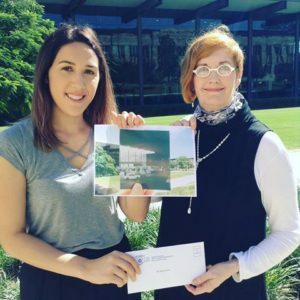 Hayley and Margaret are pictured outside the UQ Art Museum, holding a print of Hayley’s winning entry (a photograph taken at the point where Hayley took her own winning image).